Masashi Hamauzu Official Website Renewal & Facebook Page Open! IMERUAT will be on the stage "FANTASY ROCK FES 2012" ! 『FINAL FANTASY XIII-2 Original Soundtrack』is now on Sale! （C）SQUARE ENIX CO.，LTD. All Rights Reserved. Hamauzu × Kuroda Talk & Piano Concert Vol.2 and IMERUAT Live! Masashi Hamauzu × Aki Kuroda Piano & Talk LIVE! 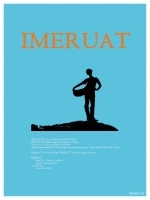 "IMERUAT" is now on iTunes and first live in Japan! Masashi Hamauzu is composing『FINAL FANTASY XIII-2』! "FINAL FANTASY XIII-2" Official Site. 『Unlimited : SaGa Original Soundtrack』2011.6.15 Re-released! Hamauzu's New Arrangements for "LEGENDS" in Stockholm! Masashi Hamauzu Solo Concert in Paris, France! Hamauzu will be attend Distant Worlds music from FINAL FANTASY in Krakow, Poland and Houston, U.S.A! "MUSIC GUNGUN! 2" Play It Now! New CD/DVD Released in January 2011! Hamauzu New Arrangement on『FINAL FANTASY IV Complete Collection』! MONOTALK vol.1 Hamauzu Masashi on USTREAM! 『Distant Worlds music from FINAL FANTASY Returning home』(DVD) 2011.1.19 On Sale! New Articles of "Distant Worlds music from FINAL FANTASY"! "FINAL FANTASY XIII" won "Soundtrack Of The Year" of Golden Joysticks Awards 2010! 『X'mas Collections music from SQUARE ENIX』11.24 On Sale! 『FINAL FANTASY XIII Episode Zero -Promise- Fabula Nova Dramatica Ω』11.17 On Sale! Hamauzu's New interview in 電撃PlayStationONLINE! Hamauzu's New interview in 1UP.com! 『FINAL FANTASY XIII Episode Zero -Promise- Fabula Nova Dramatica α』Now On Sale! New Arrangement for the "Symphonic Legends" will be broadcast live on the Internet! New Track for arcade game "MUSIC GUN GUN! 2"
New Tracks for the PSP game "勇者３０ SECOND" ! 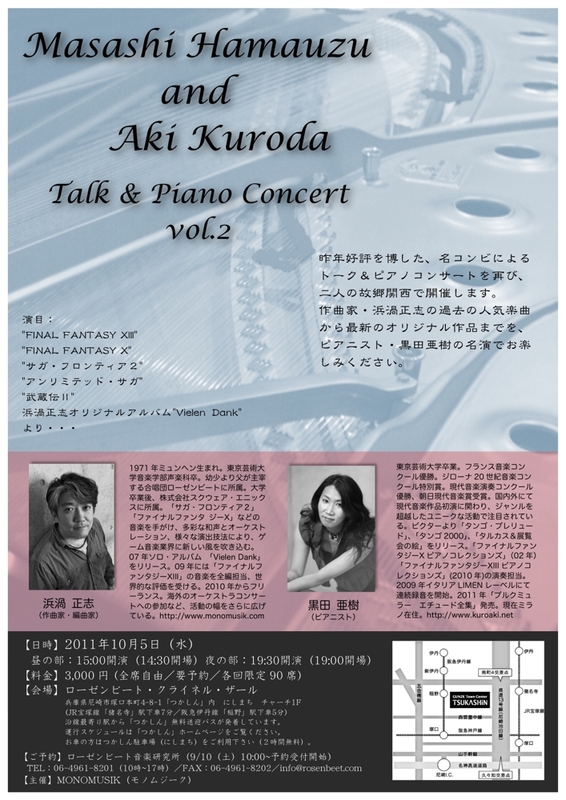 "Piano Collections FINAL FANTASY XIII" Talk & Piano Concert! 8/29 in Osaka, 9/3 in Yokohama. Distant World : Music from FINAL FANTASY in Tokyo! (C)2009,2010 SQUARE ENIX CO.,LTD. All Rights Reserved. New "Staff Room" opened on site featuring the latest news of Hamauzu! Interview with Masashi Hamauzu published in "famitsu.com". New interview in Beauty of Games! Interview with Masashi Hamauzu published in "Beauty of Games". Masashi Hamauzu Official Website OPEN! (C)2011 MONOMUSIK. All Rights Reserved. Piano Collections "FINAL FANTASY XIII"
Masashi Hamauzu Official Website / Copyright © 2015 MONOMUSIK Co., Ltd. All Rights Reserved.